I was on cooking duty yesterday and you saw the result of lunch, my balsamic beetroot & chickpea salad with mint. But, what I didn't tell you about my little mishap with dinner, did I? After having a day to think about it. I have decided to come clean! Not so good photo of the offending article! Graham's dad and I visited a local fruit and vegetable market, just a small one, but it had an abundance of gorgeous produce. From here I purchased rather large amounts of tomatoes. Lovely large ripe tomatoes and some sweet juicy cherry tomatoes. Soup was the order of the day. 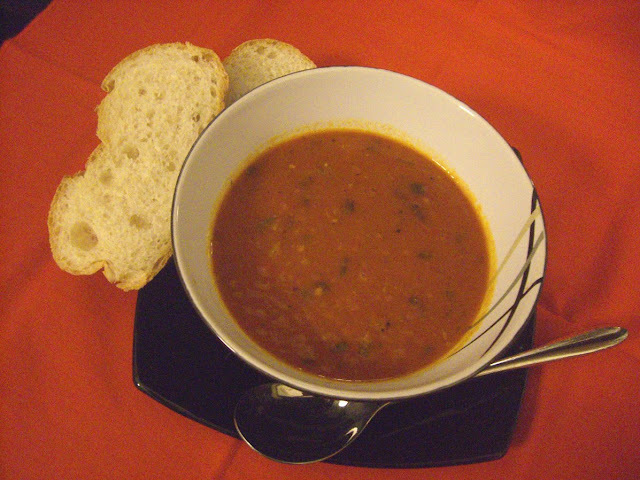 I decided to make one of my favourites, Four Tomato & Red Pepper Soup. So I am pottering about happily in the kithen making my salad and roasting the peppers and tomatoes in the oven. The smell was divine. It took me two rounds of roasting to do all the tomatoes, peppers, onions and garlic, but I was happy with all the lovely charred edges. I took the cover of the food processor and popped in the veg and sundried tomatoes and started whizzing it up. Some of it wasn't whizzing properly, so I had another go. It looked like the blackened skin of the peppers. so I fished it out with a spoon and popped it in the bin. I poured the whizzed inredients into the pot and added the stock and tomato puree. Happy as Larry, I toddled around to the side of the villa to pick some fresh coriander. Mmmm, this was going to be good soup! In the meantime, MIL came in and started clearing up while I finished the soup, which was much appreciated. The dishwasher filled up quickily, I can tell you, between all the bowls and pots used for cooking the beetroot and soup. Then she turned to me and said "where are the covers for the blender? ", so I said "on the table", pointing to them. "No, she said, the covers for the blades. They are little black covers. ", I just looked at her blankly and said "I didn't see any covers for the blades!" and then the full horror sank in! So if you want to make Four Tomato and Red Pepper Soup extra special, add some black plastic! So, so embarassing! Of course, it is now the tale to tell! I will never live it down! Ever! I'm glad my food processor blade covers are long gone, if I ever had them. But this soup sounds great. Oh, how funny! I'm glad it didn't spoil the soup. I once accidentally blended part of a wooden spoon into something I was making. I didn't mention it to my guests, and no one complained! And there was the time I picked up the jar of cumin instead of cinnamon when baking a cake. No one complained about that either, now I think of it. We've all done something like that in the kitchen, so don't you fret! What a great story to remember for ever and ever. Have you seen those commercials on television with the baby laughing and they say "laughing adds 8+ years to your life"? I love those commercials. So, I wonder how many years you just added to your life with that laugh? Ken made overnight soaked oatmeal for he and some friends one Friday night and the next morning when he was grabbing all the goodies to put in it, he accidentally grabbed the Chipotle Chili Powder instead of Cinnamon! Everyone was eating it and enjoying it, but Ken said, "Something tastes funny!" We discovered what he had done. Strangely enough, it was pretty good! That's my rule too - never tell the eater about the mishap! No one ever knows! And you get a good story out of it! Well, if you have to have a kitchen mishap, you're in a good place to do it! I bet the weather and surroundings sure helped take the pinch off it! I've never heard of blade covers for blender blades. . . my blender mishap involved the rubber sealing ring (which had a fate much like your blade covers). Oh how funny! I have done things like that more times that I'd like to remember! Hi Peter, Are you suggesting that my reading material is rotting my brain lol! Oh poor you Johanna, that must have made a right mess! Hello vbIt was good soup, although I was nervous of eating it, even though I knew the blades had come out in one piece! Hi Val, I am sure it doesn't, but you are very kind! You blended a wooden spoon Iysy, wow, I am very impressed! Oh no Judy, I hope the apricots were sweet! We all ate it Shelly, very brave and we survived it! MIL told everyone Caked Crusader! Hi Ricki, I was very embarrasssed and mortified for losing the blade covers. Thought MIL might go mad, but she has a good sense of humour and found it funny, she was more concerned about the soup! Funny. I once purposely put my my favorite plastic mug on a hot plate to keep my coffee warm while I read. Bright!!!! Soup sounds good regardless! That's hysterical. You're brave for fessing up! hey...you may have created a avant garde recipe you know. You are worse than me Parker LOL! Hi David, I think I got it all out and it tasted yummy. Very rich. Hi Susan, I had to tell really, to purge! I think I will give it a miss in future Marye! I think I'll contact 'Baxters' and see if they're interested in marketing it as a new flavour!!!! Haha great story! At least it wasn't something that ruined the soup or would cause harm to someone. Hi Lynn, I want half the credit then! Hey Ashley, it was a close thing! Hi Jen, Guilt, that's what it is! And you should blog about accidents you have or when things go wrong in the kitchen, occassionally, I think! I'd turned on one of the electric stove-top rings by accident, not the oven itself, and promptly melted my plastic bowl all over the top of the stove. The smell of burning plastic lingered for weeks... I still miss that bowl! This is hysterical! Poor Graham. Hi Jen, That is really not good, you are making me feel much better. Burning plastic is not a good smell, oh no! Hi Davimack, He found out a couple of days later. He wasn't too bothered. He said it tasted great. Hi Vivacious Vegan, What he doesn't know won't kill him. And I am sticking to that!